Welcome to the Milk Lady Farmers Markets (MLM). We happily bring fresh local produce and products to Montgomery County, Maryland communities. We are a network of grower-only farmers. The market prides itself of providing local farmers, producers, product innovators and specialty traders from Maryland and neighboring counties of Pennsylvania, Delaware, Virginia, and West Virginia access to customers in Maryland’s premier living communities. Our residents are educated, savvy, and expect high quality products that exceed government standards for freshness, quality, and value. All farmers and artisans may be inspected or juried by the operating committee in an announced visit at anytime during the season. Any vendors found not to be producers of their products may be sanctioned up to and including suspension from the market. 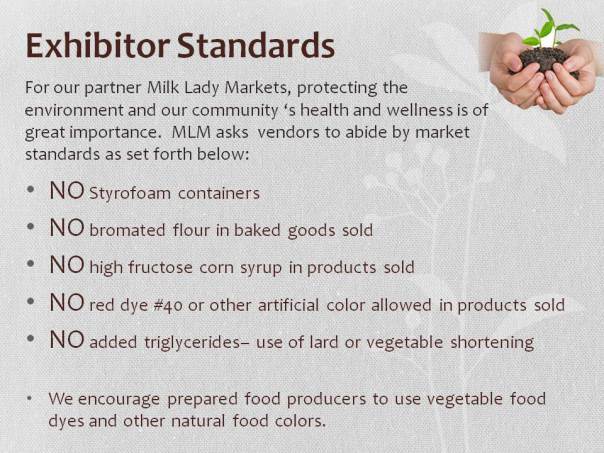 Milk Lady Markets does not allow Makers to use hydrogenated oils, or high fructose corn syrup or commercial mixes, crusts or jarred and flavored fillings. Goods sold at the markets should use local products whenever possible. We require samples of your products before you are accepted. In partnership with the Market Master, Gigi Goin (Contact: 301-792-9448 milkladymarkets@gmail.com) and in accordance with this agreement, the community drives what products are offered at the market through their feedback and participation at the marketplace and via the website. This includes the ability for add on services such as curb side pick-up and CSA pick-up. We are certified to accept WIC, SNAP and credit card processing. We reserve the right to make any and all changes to the market at any time with and without notice. Bona fide Growers –the producer of the products being offered for sale, from lands he/she owns or rents, with control over production, harvesting, and marketing of the products, and a financial interest in the products, or is represented by an employee of those farmlands. The products being offered for sale are made from whole ingredients that are original in nature with minimal processing and no chemical additives or preservatives. Craftsperson – all crafts offered for sale are original in nature and produced in whole by the seller. No crafts shall be permitted that are derived from kits. Only crafts that meet market goals of self producing or fair trade are accepted for the market. To qualify, a crafter will be required to be juried and accepted by Milk Lady Markets. Whole products – all products are baked, or manufactured by the seller should be all natural and original in nature. No baked goods from commercial mixes or processed ingredients for finishing off will be permitted. Alternating Vendor – any vendor who is permitted to participate in the market on pre-scheduled market days. Primary – any producer/vendor/grower/craftsperson that is consistently in good standing with the Market and participates in the market consistently each season. Market Advisory Team – the market advisory committee of three or five members is ultimately responsible for setting the policies and directives and overseeing the operation of the market. Market Master – the person empowered to implement market policies and directives. Market Sponsor – any governmental agency, business, organization or association that supports the market. 1. The market is an independent organization and operates with an independent operating agreement. 2. The mission of the farmers market is to improve fresh, local and pastured food availability, supplement those regarded as short of nutrition, such as through WIC program, teach entrepreneurial skills, and support local farmers and artisan businesses. 3. The Market Master is responsible for the orderly and efficient conduct of the market and for implementing and enforcing the Rules and Regulations. The Market Master will represent the market by developing and implementing a market budget, establishing market policy, fundraising, recruiting vendors, collecting fees, establishing the operational schedule, and advertising and promoting the market. 4. The Market Manager and Market Coordinator refers to a member of staff responsible to handle logistics, space control, attendance records, and other operating duties at each market. 1. Each market location is posted on the Milk Lady Markets website. The markets operate every market day, rain or shine. In the event of market cancellation due to hazardous weather vendors will be notified via email or call or text. 2. Vendors may arrive to set up as early as three hours prior to market opening and must stay though the end of the market day to provide a full market to shoppers arriving throughout market hours; unless the Market closes due to inclement weather. Vendors are to be completely set up before the market opens including prices posted. 3. Vendors may leave early only under extenuating circumstances and with prior permission. 4. Vendors must notify the Market Master no later than 5 days before the market day if they will be absent. 5. Vendors must provide 10 x10 tent canopy coverage for all tables with saleable product and all tent canopies are to be secured with 25lb weights on each leg, at all times to prevent toppling. Anyone with inadequate weights may be asked to leave. This is a safety issue. All canopies, umbrellas, and other stall cover must be sufficiently and safely secured to the ground, from the moment the canopy is erected at the start of the market day until the moment immediately before it is taken down at the end of the market. Umbrellas are allowed by written permission only. No 12’ X 12’ or larger tents are allowed. If tents are not adequately secured, market may ask the farmer or producer to leave the market or rent weights for the day. Sufficiently means at least 25 pounds per leg for canopies, and at least 50 pounds for umbrellas. One canopy manufacturer recommends at least 40 pounds on each corner of a 10' x 10' tent. - Canopy weights should not cause a tripping hazard. - Canopy weights should be tethered with lines that are clearly visible. - Canopy weights should be securely attached to the canopy legs. - Canopy weight should be on or near the ground and not above people’s heads. Who May Sell at the Market? Vendors, who demonstrate professional conduct, take full responsibility for their activities at Market and for those assisting them, and confine food and trash disposal to their assigned spaces are welcome at the market. 1. The use of the market is restricted to those who are bona fide growers, crafts persons, producers of homemade products, or other fair trading vendors approved by the Market Master. Vendors may, on a limited basis, supplement their product line with additional Maryland/DC/VA/PA/WV neighboring county only products, as long as that product is otherwise missing from the market, the market verifies the chain of supply, and the Market Master has given permission for the supplement. No more than 25% of the table may be supplemented. The permission is valid for one season and must be re-applied for in writing each new season. 2. All agricultural products may be sold at the market, including but not limited to locally grown fruits and vegetables, dairy products, meats, flowers, plants, honey, eggs, herbs, wine, beer, spirits and related products. 3. Craft vendors may sell products that they have hand-produced themselves. 4. Bakers who have baked the products themselves and who possess the proper licensing from Montgomery County Health and Human Services. 5. Prepared food vendors must hold a health department’s farmers market license. Please note we do not allow Styrofoam food or egg containers, only compostable and recyclable containers. 6. Products not specifically identified must be pre-approved by the market management. 7. All applicable food safety regulations, both state and local, must be adhered to at all times. 8. In accordance with this agreement, inspections will be made only with the farmer/owner or their representative present unless written permission is given. Vendors must provide any help necessary to thoroughly document products and conditions recorded at the inspection. 9. All new vendors will be subject to a ninety (90) day at-will probationary period commencing on the first day of the selling in the market. 1. All assigned spaces must be swept clean and waste bagged and removed at the end of each market day. Vendors are responsible for the disposal of trash. Improper cleanup and disposal will lead to dismissal from the market for that season. Vendors must provide garbage receptacles for any waste generated by their wares, and remove their own garbage from the market. Receptacles provided by the Market are intended for the use of our customers and guests. 2. All vendors must have a sign clearly showing their business name or business type name. Farmers are required by Maryland law to have a clearly displayed sign with the state of origin of their produce. 3. Each vendor will be responsible for all equipment and supplies for the setup of a booth. Displays should be constructed in such a way that they do not block customer walkways nor pose any other hazard to customers. 4. Vendors who provide samples and/or products that will result in waste material, such as cups, napkins, rinds, and corn cobs, must provide containers for waste disposal. 5. Vendors are required to keep their market space neat and clear of obstacles, litter, and debris. 6. All produce displayed for sale must be at least 6 inches off the ground with the exception of heavy or large items such as pumpkins. 7. Sellers must post prices. It is expected that prices will be fair to consumers, the seller and fellow sellers. Collusion among sellers to attempt to influence prices is strictly prohibited. 8. No smoking, alcoholic beverages, or firearms are permitted within 50 feet of the market. The exception is bottled wine, beer or spirits purchased at market-sponsored tastings. 9. No hawking, proselytizing, or amplified music is permitted at the market by vendors except with permission. 10. All products offered for sale must be of good quality and condition. The Market Master reserves the right to direct any inferior goods be removed from display. Failure to remove products deemed inferior will result in loss of market privileges. 11. Each vendor in the market must be directly involved with or knowledgeable about the production of the produce or products being sold at the market and be able to communicate honestly with consumers. 12. All required vendors must provide proof of general liability coverage in an amount not less than $1,000,000 AND name Milk Lady Markets, the property owner, and the market sponsor as additional insured as required by each individual market. 13. Vendors are responsible for the actions of their representatives, employees, or agents. 1. Fees and payment schedule are assessed seasonally by the Market. Initial application fees will be due and paid via Credit/Debit card or for pre-season. 2. The space fee is paid seasonally or in aggregate once monthly. All vendors must submit the fees for each entire month to the Market Master in cash at the market, by the 25th of each prior month. If the monthly space fee is not submitted, the Market Master will investigate the reason behind the delinquency and due course taken, including dismissal from the market. 3. Space will be assigned by the Market Master on a seniority and best-fit basis. 4. Seasonal Farmers/vendors will be assigned a spot for the season, changeable only by approval from the Market Master. The spaces will be reserved each season for vendors, provided that all space fees are kept current. 5. Reserved market spaces must be set up and occupied at least 45 minutes prior to opening the market; 30 minutes for food trucks. 6. Late arriving vendors are not guaranteed they will be assigned the same space each week they are at the market. 7. Vendors arriving after the market opening may be asked to resign the market. 8. All vendors must have paid the MLM application fee prior to starting at the market. 2. Complaints will be reviewed by the Market Master in an attempt to resolve the issue. If the Master is unable to resolve the complaint, the issuer will be informed. 3. The submission of application for admission to the market serves as the vendor’s agreement to abide by the rules of the market as established by the market and enforced by the Market Master. Violations of the rules of the market may be grounds for warnings, dismissal from the market or both. The first violation of the rules will result in a verbal warning by the Market Master. Documentation will be kept on file by the Market Master. The second violation of the rules will result in a one-week suspension of selling privileges. The Third violation of the rules will result in dismissal from the market. 4. At the discretion of the Market Master, when a violation occurs that jeopardizes the health of a customer, another vendor, market management, or the overall well being of the market, the Master may suspend or call for immediate dismissal from the market. I (we) the undersigned have read the Rules and Regulations of the Milk Lady Farmers Markets (MLM) and do agree to abide by all rules and regulations and that they are subject to change. I (we) further agree to operate my (our) space in accordance with these rules and to pay all applicable annual and monthly fees as set out in the rules and regulations, and I (we) will abide by them. I (we) do understand that the space fee, length of season, and hours of operation are set in the rules and regulations and I (we) will abide by them. I (we) further understand that failure to comply with the rules and regulation of the Milk Lady Farmers Markets (MLM) could result in dismissal from the market. As a vendor, wishing to participate in the MLM Market, I (we) agree to SAVE, HOLD HARMLESS and INDEMNIFY the Milk Lady Farmers’ Markets (MLM), its sponsoring agency, members and employees and Montgomery County from any and all liability or responsibility pertaining to any damages to person or property on the site assigned to me (us) by the MLM Market, when such damages or liability arise out of acts on my (our) own, or of my (our) employees or associates, located at such site. I (we) verify that all information I (we) have provided about my farm and/or products for sale on the MLM Market forms is true and accurate. I (we) understand that the MLM Market operates on limited funds. I (we) also acknowledge that the MLM Market’s beneficial purpose will be impossible to pursue if it is subjected to costly litigation. Wherefore I (we) hereby agree that as a condition of my participation in the Milk Lady Farmers’ Markets (MLM), I (we) will not resort to litigation against the Milk Lady Farmers’ Markets (MLM), its officers, management, and affiliated entities. I (we) acknowledge full responsibility for all my (our) activities in the Market (and for those assisting me (us) throughout the term of the market season (April to November or Winter Market or Limited special Event). I (we) acknowledge the authority of the Market Master to immediately settle any disputes regarding product legitimacy, procedural and vendor conduct violations, and impose any penalties, including possible suspension or removal from the Market, subject to appeal under the procedures set forth in the Market Operating Agreement. I (we) agree to allow the Market Master, Market Committee, representatives of MLM and/or your County Extension Agent or health Department to inspect the premises where the products offered for sale, are produced, at any time. Failure to allow an inspection will constitute a violation of the Market Operating Agreement. I (we) understand that MLM does not carry any insurance policy on my potentially hazardous products, to cover individual participants, and that I am required to carry such insurance. I request permission to sell at the 2019 Milk Lady Farmers Market run by Milk Lady Markets. I have read and agree to abide by the Rules and Regulations as outlined in this vendor Operating Agreement as well as all laws, codes and regulations, to cooperate with market management and to honestly pay the required stall fees. I agree to indemnify and hold harmless directors, employees, representatives and agents of this market, from and against all liability, claims, demands, losses, damages, levies and causes of action or suits of any nature whatsoever, arising out of or related to my activities at this market. Complete the information requested here to e-Signature-verify: I certify also that I agree to comply with the rules of the operating agreement.